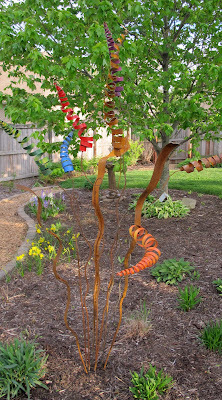 I accomplished another goal for the garden redesign project today when I purchased some seven colorful tiger tails and three long leaves from Girly Steel to set up in the high summer garden called August Dreams Garden. The garden designer originally suggested and chose plants that will bloom primarily in late summer and fall for this garden area, which means that for the rest of the year, there's not much going on in it. Now there will be colorful tiger tails bobbing and dancing in the breeze year round. Collectively, I'm calling this grouping "Catch a Tiger by the Tail". You may interpret its meaning any way you wish or not at all. But if someone asks me, I'll tell them it means to conquer your fears, grab that tiger by the tail and see what happens. The worst that can happen is you have to let go. The best that could happen is you might tame that tiger and be ready to move on to a bigger tiger. Nope, I'm not telling you what my tigers are. I'll grab those tails in due time, in and out of the garden. Or maybe, I'll grab the tails by the tigers? It's good to have reminders to try new things, to conquer fears. It's even better to have a new garden sculpture made by a local artist be that reminder. Very cool. Do they move around a bit, in a good wind? Love the sculpture...and I really love Fraggle Rock! Good memories of my kids' childhood. But if someone asks me, I'll tell them it means to conquer your fears, grab that tiger by the tail and see what happens. The worst that can happen is you have to let go. Surely the worst that could happen would be being killed, eaten, or permanently disfigured by a tiger, with a non-zero chance of releasing a tiger into the general population so it could kill, eat, or permanently disfigure a preschool full of unusually adorable toddlers. I concede that that would also involve letting go of the tail, but think you may be burying the lede a bit. now now mr. I think this Tiger By The Tail is whimsical and in just the right place. If any preschools tour the garden, I imagine they will be delighted. And safe. Love the Tiger Tails, and the Fraggle Rock song. One thing I want for my garden is some sculptural interest, and I have not found what I'm looking for yet. Your choice seems great. I have some Girly Steel artwork in my garden as well and love it! What a creative way to add color! I love the whimsy! I love the Girly Steel tiger tails. I pinned several of her sculptures recently and can't wait until our new home is built so I can purchase them. However, I do absolutely love the tiger tails in the garden, as well as the sentiment! Thank you. I love tending to my garden, and your blog just makes me love it more.